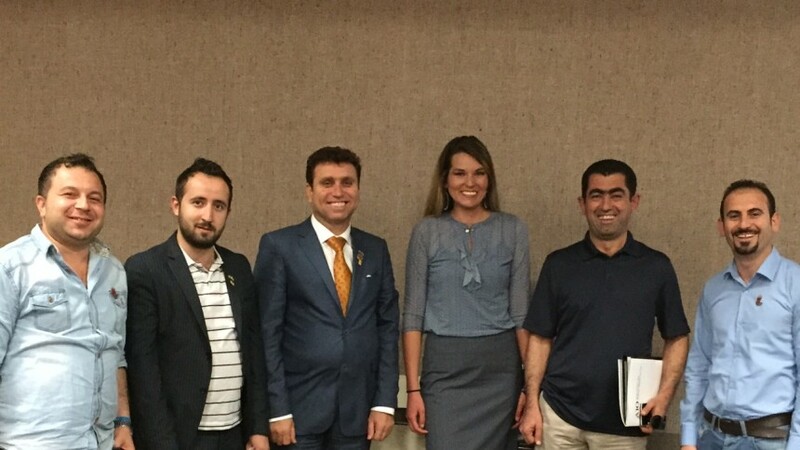 I had the honor of speaking with a group of leaders from Northern Iraq, who are traveling through America as part of an initiative led by the U.S. State Department and Global Ties ABQ, a nonprofit dedicated to building bridges of international awareness and understanding among the people of New Mexico and emerging leaders from around the world. The group included professionals from a variety of backgrounds and disciplines: two broadcast news journalists who face great obstacles in reporting objective, accurate news about public business in Iraq; a government official who has been active in setting an example of transparency in a still-secretive nation by releasing budgets and financial statements online; a human rights advocate who works for a non-governmental organization; and an attorney who has been helping to draft the new “access to information” law, which is intended to mirror the Freedom of Information Act in our country. After briefly explaining the work the New Mexico Foundation for Open Government does and the tenets of Sunshine Laws in New Mexico and the United States, I had the opportunity to listen to questions they raised about transparency and how we implement open government laws in practice. The human rights advocate was curious to know how we can trust that public information online was actually disseminated and published by the government. I explained our “.gov” website extensions, and he said that was something new that was just now being implemented in Iraq. The television broadcaster explained that when requesting information from public officials in Iraq, obtaining records generally boils down to your relationship with the record keepers. If you are not well liked, you will not gain access. While I admitted that sometimes, especially in small towns, that can be a problem in New Mexico, his experience with this issue was much more far-reaching and commonplace. The government official spoke about how it was often frowned upon, or even strictly forbidden, to release embarrassing or incriminating information. I explained that similar issues sometimes arise here, but that it is better in the long run for the government to be transparent and supply the information. While the public may be willing to forgive some mistakes or indiscretions, the people will certainly come to mistrust furtive public bodies that consistently operate behind closed doors. The attorney working to write the access to information law was interested to learn how often exceptions to New Mexico’s Inspection of Public Records Act were used to keep fundamental facts secret. He had, for example, submitted a request to learn how many students were enrolled at a particular Iraqi school, and he was told the information was confidential and protected under a “national security” exception. I was surprised to hear that such basic information was not available to the public in Iraq. I explained that while our officials sometimes cloak public records under the guise of legitimate IPRA exceptions, our organization exists to educate, persuade and sometimes litigate to ensure Sunshine Laws are upheld. And when documents are revealed to the public, we often find that they should have never been withheld. To the best of my ability, I tried to emphasize that in America, we believe that because we elect our officials and pay their salaries with our tax dollars, we have a fundamental right to know what they are doing. We have the right to question their authority and decisions. This seemed to be a novel and unfamiliar mindset for the Iraqi visitors. In the end, I was most struck by how fortunate we are as Americans to live in an established democracy, in which the notion that citizens act as their own governors is already so ingrained and accepted in our society – though we are all guilty of taking this privilege for granted. Our democracy belongs to the people. And we would do well to remind ourselves of the tremendous opportunity and responsibility we have in shaping our government. See the column in the Albuquerque Journal.